Direct Ocean Front, 1bd/1BA Condo in Kahana Maui - Awesome Views! Come visit our large corner oceanfront condo with fantastic views of Molokai and Lanai,. You can watch spectacular sunsets and enjoy whale watching from your private lanai. Conveniently located between Kaanapali and Kapalua, the condo is ideal for celebrating that special occasion and all that Maui has to offer. Unit has just been updated with new ceiling fan, new refrigerator and new dishwasher. We have a large bedroom with a king-sized bed. In the living room there is a queen-size sofa for two more guests and the kitchen is completely equipped. The condo includes beach towels, beach chairs, cable TV, WiFi, CD and DVD players. Kahana Reef is located near some of the best beaches in world, and less than 10 minutes away from award winning golf courses like Kapalua and Kaanapali. There are many great restaurants and shopping nearby, and it's only a few miles to Kaanapali or Kapalua, and 10 minutes to Lahaina. We also rent out unit #416 in this same building, it is very similar to this unit: https://www.vrbo.com/1490125 check it out if dates are not available or if you need additional days or perhaps 2 groups! We also rent out unit #416 in this same building, its almost identical, same square footage, with a spectacular view, one floor higher :-) www.vrbo.com/1490125 Check it out for more dates, or if you want to come with another group. Come and experience the Aloha spirit of Kahana Reef. Ocean front, beautiful views, located next to the best beaches in the world. Close to golf, restaurants, shopping areas, bus, waterfront, and the best beaches in Maui. 180 degree view of Lanai and Molokai from condo. The beach is a minute walk from the property and is popular for snorkeling, paddle boarding, surfing, and wind surfing. There is a beautiful sand beach 200ft north of the property. 180 degree Ocean View looking straight out at the Island of Molokai across the Molokai Channel, and looking to the left at the Island of Lanai. The ocean is 50ft from the balcony. The sound of surf is music to the ears. 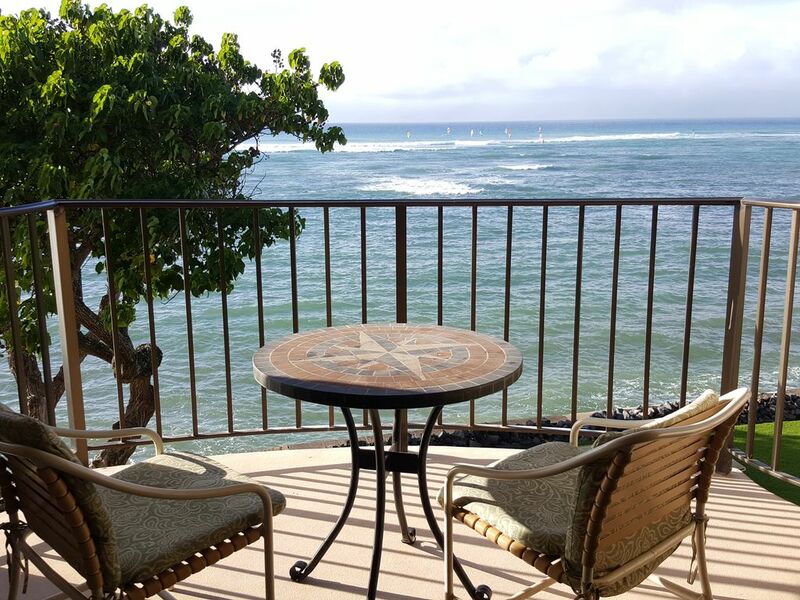 Relax on the lanai and enjoy awesome sunsets, humpback whales breaching in the Molokai Channel, turtles everywhere, and kite boarders and surfers showing off their moves. Right on the Ocean, direct waterfront. Book share located in public laundry room. Kayak / paddle-boards are available to rent nearby. Numerous boat excursions available for hire at several locations. See brochures in hallway near mailbox room. Snorkeling Equipment available to rent or purchase nearby. Gated solar-heated pool surrounded by lounge chairs. Can’t beat the veiw! We liked the convenience of the elevator, bad knees! Would like to see updates on the carpet and sofa. Needs curtains in the bedroom!! Bed and pillows were very nice. Owner super with concerns and questions! This unit is well positioned with sweeping views and plenty of room to spread out. Comfortable furniture, bed and great amenities outside on the ocean and poolside. I would love to return for a longer stay. The property was clean and easy to access. The only minus was that there were no bedroom curtains, so the lighting from the hall shone brightly into our sleeping area all night. Otherwise the property was exactly what was advertised and just what we wanted! We had a really lovely time at Mark’s condo in Maui. It was the perfect home base for our 5 night stay on the island. The location was great - right on the water (the sunsets are amazing!) and near some fun restaurants (we made several stops at Maui Brewing Co and the fish market down the road). Having the general store around the corner is a real plus as well. The only flaw was an extremely bright light that shone through the bedroom window all night with no way of blocking it making it a very bright sleep - but that can easily be fixed with a curtain. Thanks for your kind review. We are in the process of putting in a new bedroom curtain soon. We came to our favorite place, Kahana Reef, expecting the peaceful quiet place we have experienced for nearly 20 years. Instead, we were bombarded with amplified guitar noise for all except 4 days at the beginning of our stay. We asked the offenders to stop and they laughed in our faces. We contacted the on site manager, who said he would ask them to turn it down. Nothing happened. We again asked the manager to make them stop; nothing happened again. Note that the condo owner had informed us that any noise that disturbs another unit is not permitted. We also could not use the pool because it was continually occupied by screaming children cannonballing into the pool, despite a large sign which states that excessive noise and diving into the pool are not permitted. This is not the lovely place we have known so well, and we do not plan to return. This is our first time of hearing about a noise problem. When you asked, I had our resident manager talk with the group renting out the bottom floor unit. It turns out that the group staying there was a Hawaiian band playing acoustic instruments and they were playing for the majority of the condominium guests during mid day on two consecutive Sundays along with a Hula dancer. I was told, there was a group of 60 mostly condominium owners and guests enjoying the music for a couple of hours. This is not a usual event but please understand that occasionally these events will happen. Clean unit. Mark was very helpful and responded quickly to requests. Contact us for Summer Special Rates: $135/night for 7 days or more, from May 1 thru October 31.